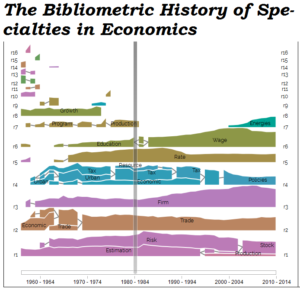 This web application allows you to explore the specialty structure of economics from the late 1950s to 2014. The representation is based on a network of all publications in economics journals as indexed in the Web of Science – a total of more than 400,000 documents. It is produced by an algorithm that automatically detects clusters of articles based on their references. Roughly speaking, the clusters are such that articles in a cluster share more references relative to articles outside the cluster. Click below to explore it!